Lakeside one, two and three bedroom cottages with fully outfitted kitchens suitable for groups and families. Large decks with tables, chairs and umbrellas. Propane BBQ’s around the cottages. 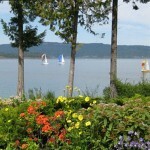 Great common area by the lake for recreation such as volleyball, croquette, bocci ball… Gentle walk-in swimming beach. 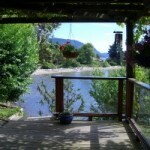 Canoes, rowboats, kayaks included for guest use. Beach house contains a charcoal BBQ.